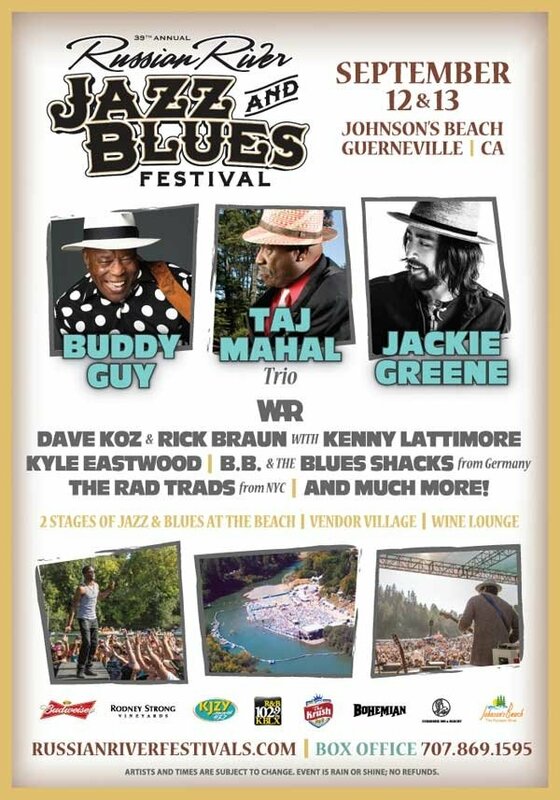 The 39th Annual Russian River Jazz & Blues Festival returns to Johnson’s Beach & Resort in Guerneville, CA on September 12 & 13, 2015. Two great festivals over one weekend – voted Best Music Festival in Sonoma Country by the readers of the North Bay Bohemian. Join us for a weekend of incredible music, dancing, wine tasting and loads of fun! Headlining the Blues Day on Sunday, September 13th will be the legendary award winning Blues icon, Buddy Guy, alongside friends Taj Mahal Trio, Jackie Greene and more! Music fans can purchase Single Day & Weekend Passes to the festival and enjoy 2 stages of jazz, blues and roots music over 2 days at Johnson’s Beach – a beautiful venue surrounded by California Redwoods. The festival also features a Wine Garden with tastings from local wineries, a variety of craft & merchandise vendors plus an eclectic food court. Tickets are available through www.russianriverfestivals.tix.com or by calling the Box Office at (707) 869-1595.